Also known as „dumbing down Morrowind”… Todd Howard-style. Yes, because "convenient" automatically means "dumbed down". There are numerous examples of actual dumbing down in later Bethesda games, but not having to open each container individually in order to see what it contains ain't one of them. How does this dumb down Morrowind? Nerfing the combat or removing attributes is dumbing down--this is just a nice additional way to loot things. Adding Quality of life features =/= dumbing down the game. Adding a feature to the game that saves the player time when it comes to these type of tasks is a good thing. This not a cheat nor does it makes the game easier, but it increase the enjoyment of playing it. dumbing down by adding things, lol what! Another thing that need to be in exeptions list is an assasin body with special ebony dart. Taking this dart causes the journal record, but not if it was quicklooted. 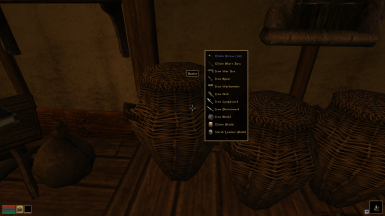 This mod has saved me hours worth of looking in empty baskets. Thanks for making this and continuing to improve it. Right now my only issue is that when I turn off the loot-menu for plants, I still get a loot-menu prompt telling me I can't see inside this container. Not a huge deal and probably has something to do with other plant mods I have. Other than that, it just makes the game flow better. You're the best in the whole town. 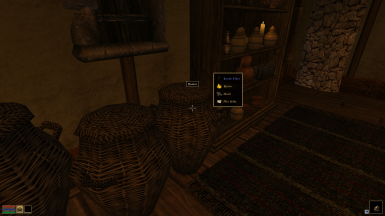 Go into the mod options and allow looting of scripted onactivate, you have graphical herbalism probably? You are right, that did fix it. The only issue now is that after looking at a plant I can't see any labels on my map screen (like when you hover over a square and it tells you where that is) until I open a container or talk to someone. If there's any easy fix, awesome, but no worries, I don't expect you to work around my mod list specifically. Hi, this is great mod, but it has one little ussie. The option to disable scripted containers is a good idea, but it is not enough for safe looting. For example, the barrel with Fargot`s ring in Seyda Neen. If player try to take quest item out of such container with help of QuickLoot menu then magic interface menu will never appear. It seems to me that the mod needs a blacklist, as implemented in some other MWSE mods. My mistake was to consider that such containers is not scripted. The barrel has its own script but not onActivate one. How could I change your main.lua script for checking for ANY type of scripted containers? This is a great mod and may actually make me finish the game for once in my life. 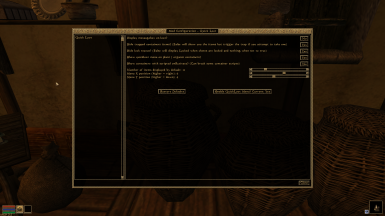 I've got a question though, is it possible to make it compatible with Ownership tooptip from morrowind code patch? Right now ownership with Quickloot only shows on locked or trapped containers. if you have animated containers or a mod that adds a script to every container, you must show containers with OnActivate. Does that mean you'll only know what's inside a container after you open it? I actually prefer that mechanic; makes the PC less of a psychic. Speaking of psychic characters, I'd love to see a Lua mod where you won't see an NPC's name until after you talk to them once -- like in Deus Ex. At first you'll just see their race and class, like "Imperial Mage" and such. That's a very cool function. There's a mod for Skryim that does just that. ( https://www.nexusmods.com/skyrim/mods/56744/ ) I've been using it for a very long time. Morrowind should benefit from some of that love also. I second SpaceDevo on this one! I had the same issue. Try updating MWSE by running MWSE-Update.exe in your Morrowind folder. The issue went away when I did that.